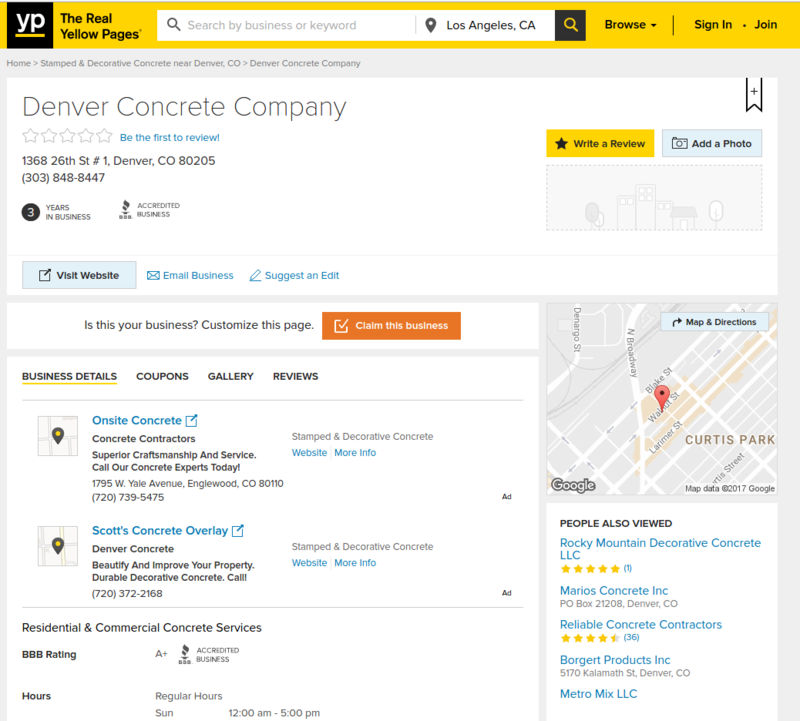 The purpose of this short analysis is to find out how Denver Concrete cornered the concrete industry in online sphere in Colorado and how you can do it too. 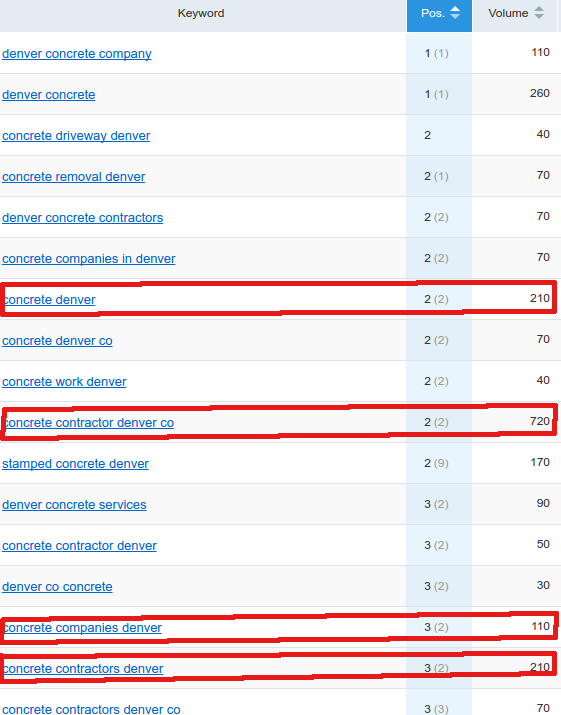 There are over 720 searches for that‘Concrete Contractor Denver CO’ search term alone. 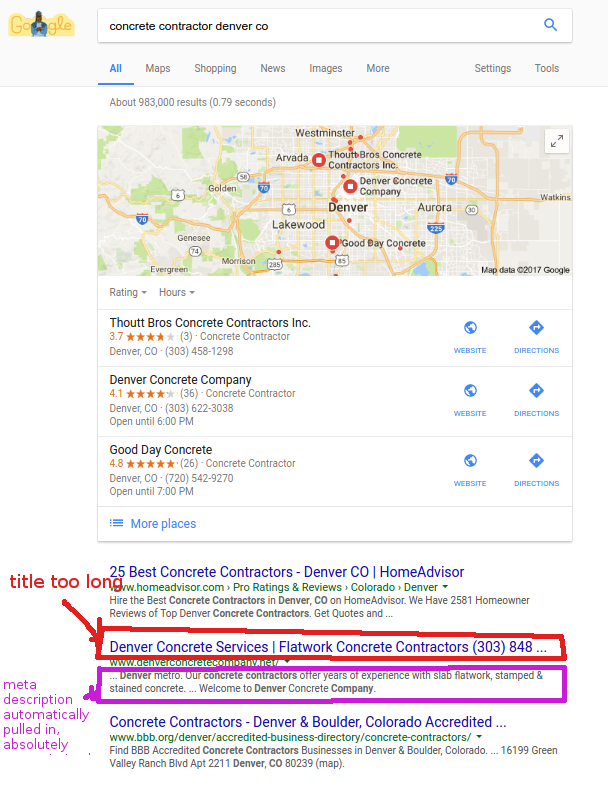 The Denver Concrete website ranks at position #2 and #1 for many other key search terms important for concrete contractors including ‘Concrete Driveway Cost’ and other high traffic generating terms related to concrete niche. Let’s have a look at the organic traffic this website generates every month. We will use this software: SEM Rush. 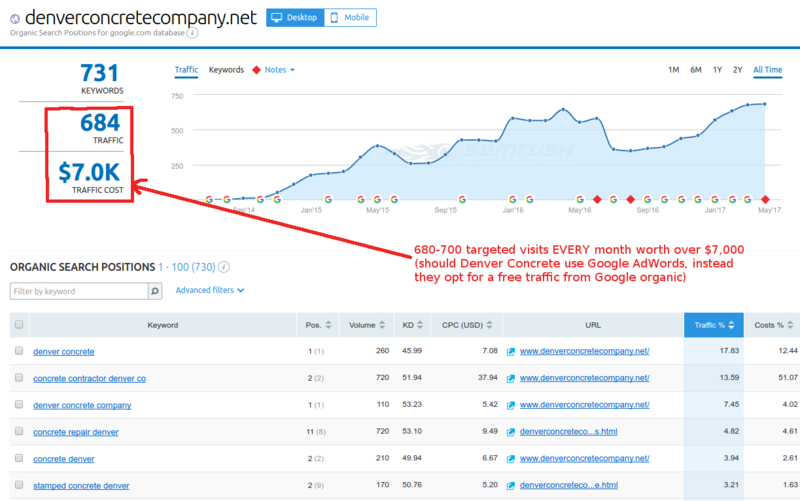 Denver Concrete Company gets an excellent 680-700 targeted visits each month. AND that was organically alone – without any paid advertising. And that is not even half of the key search terms Denver Concrete ranks in the first page in google.com! Denver Concrete Company is an established and well known business in this market space in Colorado. 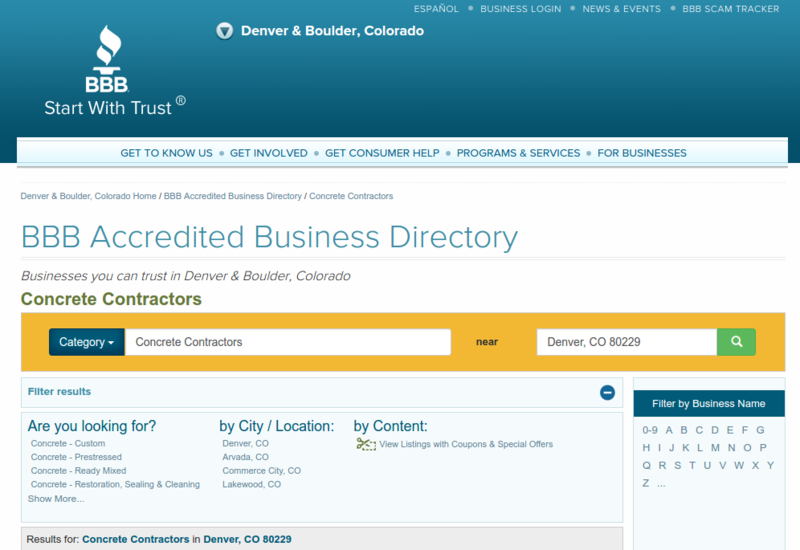 Evident by the 370 searches for the company itself ‘Denver Concrete” and ” Denver Concrete Company” each month. As you can see simply being found on the first page is now no longer enough. 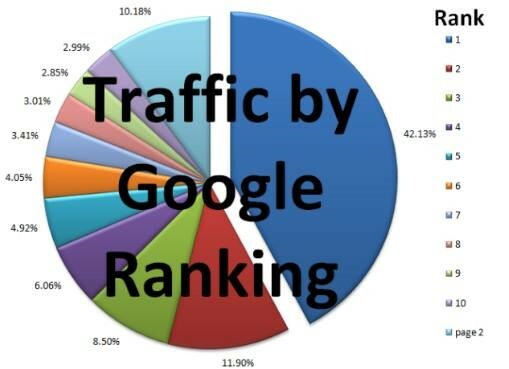 60% of all the traffic generated by any one search will click through to the top three results in the first page! A point to note when analyzing your own website is that only 5% of ALL the traffic from any search will venture past page 1! 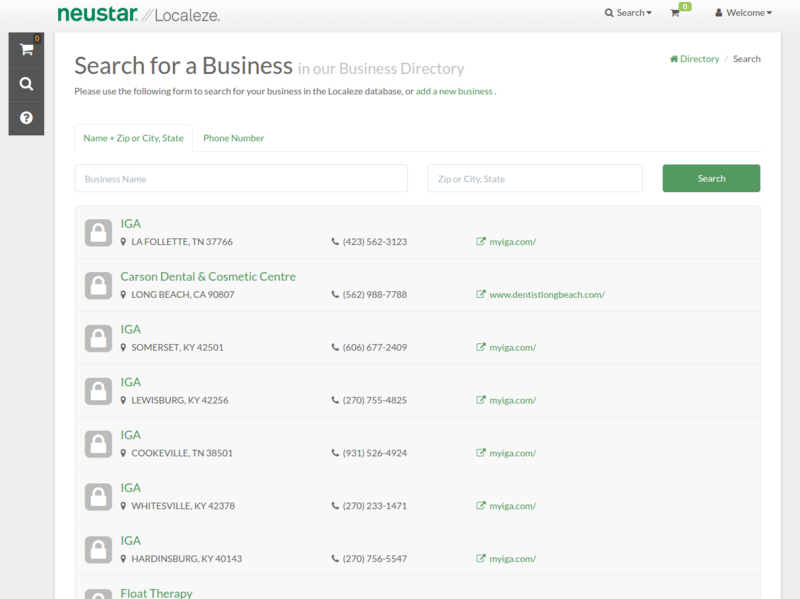 All the information a searcher will gather and all the businesses they will ever work with will be found right there on the first page. 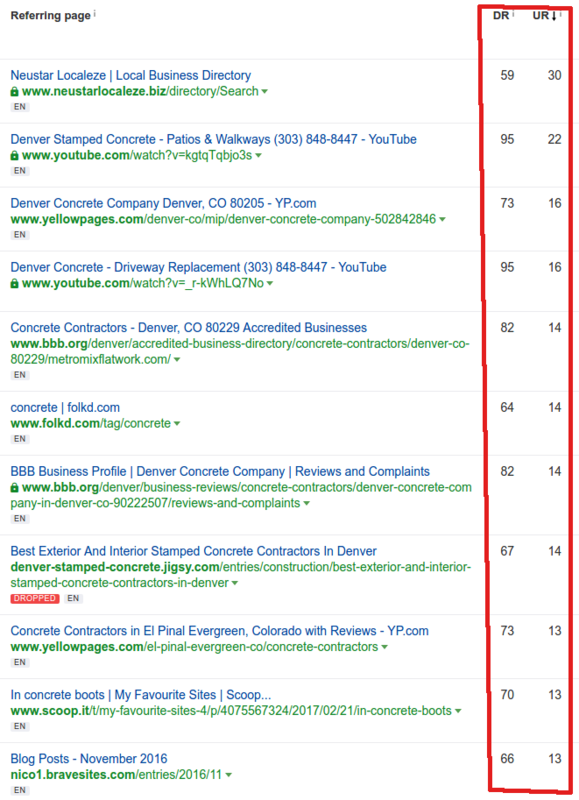 By now you must be asking: How Denver Concrete dominates the search results? First appearance: this site has a solid design overall. With over half of all searches carried out on a mobile device it is vital the mobile site is setup to offer the best user experience and convert visits to sales. 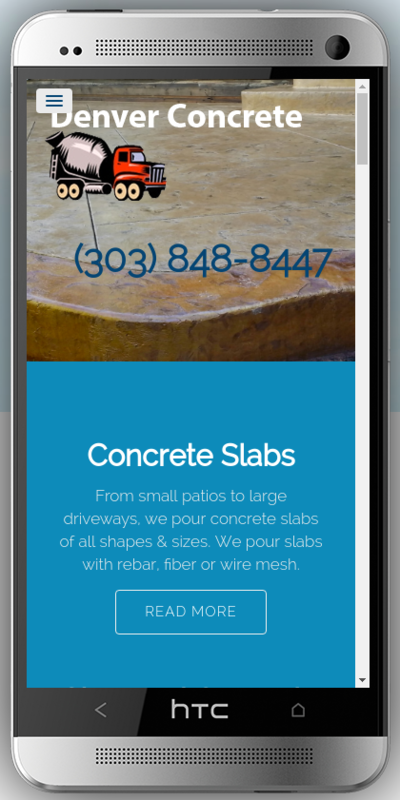 Denver Concrete’s site is mobile friendly and looks average on mobile devices. There is a clearly defined telephone and that is the only good thing. The biggest weakness here is that there is no Unique Sales Proposition and clear Call to Action. As an addition, phone number is not click-able. Implementation of these 3 things would drastically improve conversions from visits on a mobile device to sales. It is stated that in today’s fast paced world anything over 2.5 seconds is too long for the average visitors patience. 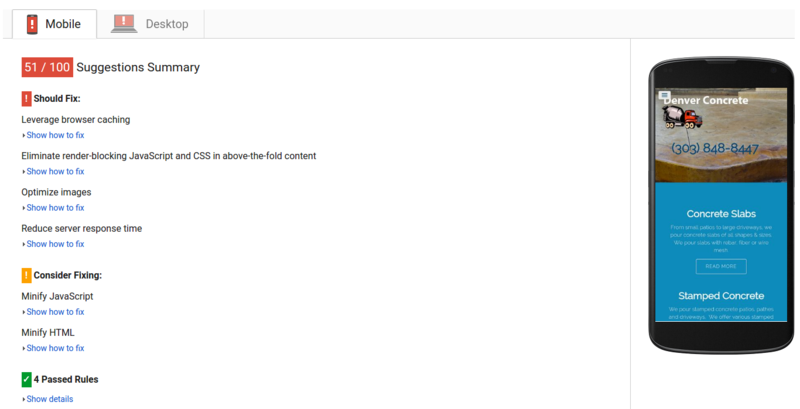 It is possible to do a free mobile page speed test with Google Developers page insights tool: https://developers.google.com/speed/pagespeed/insights/ This free tool give’s us a list of the issues that need to be addressed. As you can see Google isn’t too impressed with Denver Concrete’s website. Check your site and then ask your developer to take care of any issues. We ran Denver Concrete’s site through Screaming Frog premium software which allows us to crawl the website and pick up any potential technical issues with website onsite structure. We have highlighted a number of errors. For SEO purposes duplicated or missing Page Titles, Meta Descriptions, H1 and H2 Headings must be addressed. Where the Meta description is over 156 characters they will not display properly in the search results. The same goes for Titles and Header tags were they exceed the 65 and 70 characters respectively. These are conversion factors that will possibly affect the decision of someone viewing the search engine results as to which site they will pick from the listing to visit. As you can see, the Title and Meta Descriptions are not optimized to encourage a click through from visitors. Although the layout is different they have packed in some important conversion factors, benefits (3-year warranty), social proof (1000 concrete jobs done), usp (residential concrete) and telephone number. Now lets get into how Denver Concrete gets its traffic. They have over 620 followers on Facebook. Over 150 followers on Twitter. They also have a small number of YouTube videos and tens of photos of their work posted on Pinterest. Social media involvement not only helps with brand awareness, trust and can even generate organic leads. 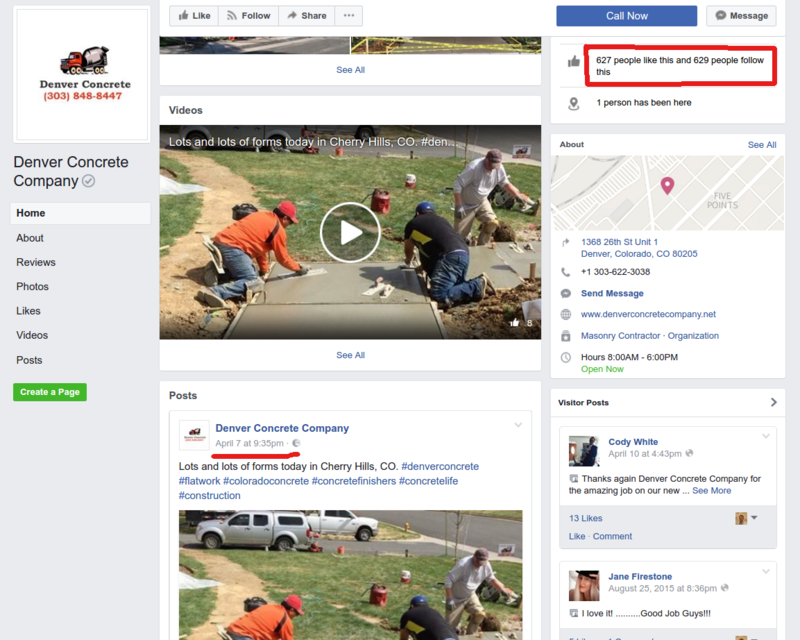 Despite not regularly updating all their social media platforms, Denver Concrete still has social signals, because people interacted with their brand, shared and discussed with their peers about their services. Backlinks, where a website is linked to another via a hyperlink, are still the number one factor among over 200 other factors that Googles algorithm considers when ranking a website. They are viewed as votes of confidence by search engines, as a link to another website suggests their is valuable content at the destination. 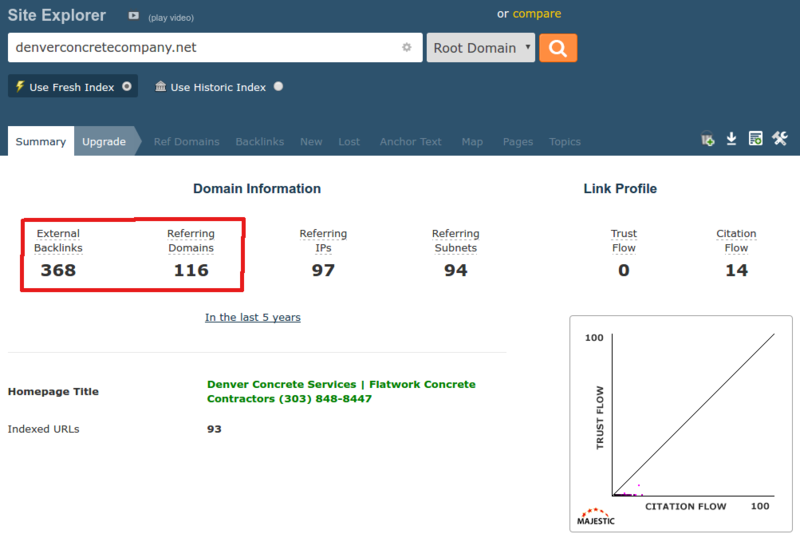 Now we will analyze the backlink profile of the Denver Concrete site using Majestic SEO’s software from www.majestic.com, We will gauge not only how many back links a site has but also the quality of them. The more technical aspects of this analysis are discussed in greater detail in our comprehensive SEO guide, which will be available here. 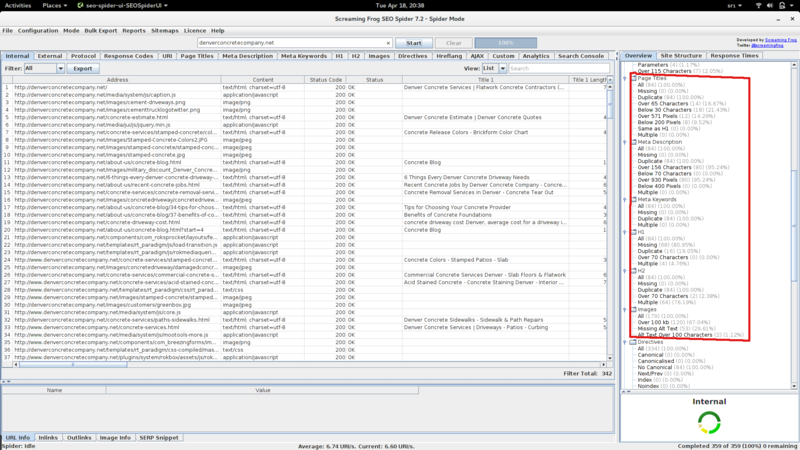 As you can see there are over 360 backlinks pointing at this site from 116 separate domains or website URLs. There are no education, nor government link pointing at the site which is not a good signal since these are seriously high trust factors that could be considered in ranking this site. The next thing we will look is the quality of the back links pointing at their site. We will use another premium software AHREFS. These are some solid links in there. We discussed this in more details in the Online Marketing Guide for Concrete Contractors, which will be available soon for readers, but the Domain Rating and Page Rating of this first few backlinks are high enough for a local market, DR over 50, and the trust flow / citation flow pairs are all closely matched in ratio. Clicking through on the hyperlink in this list of back links to the referring domain gives us a better idea of the quality. As you can see they have been featured in a range of local directories and certification bodies which are high trust, high authority sites. Their back link profile is also more or less what we’d expect to see with a site ranking this well. The anchor text ratio is also ‘clean’. But overall the ratio looks good, the most important thing is that it is not keyword heavy (which could lead to penalty) and clearly works! 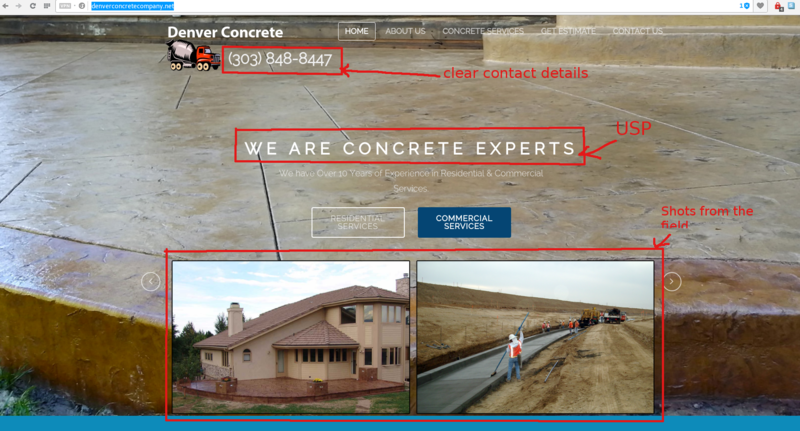 Denver Concrete are doing a good job with their digital marketing. The website is solidly designed but lacks click-to-action buttons on their mobile version, which would convert visitors to sales much more easily. Their social media is well managed, however they don’t engage with their followers regularly. The company is well known in a local Denver market and well cited, a fair number of high trust and high authority local directories and certification bodies are linking out to it. There are a number of missing and duplicate Titles and Headings and the meta descriptions are poorly optimised. 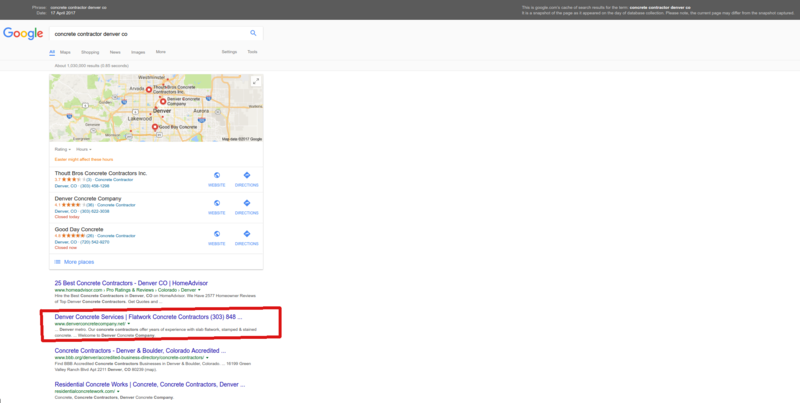 This company is dominating the search results and pretty well setup to convert the traffic they generate to paying clients month in month out. To compete with and eventually out rank this company is absolutely possible but it will take at least several months by an expert in this industry. We at Web Sharks, have the experience and resources to take the necessary steps to beat Denver Concrete and other competitors of yours. 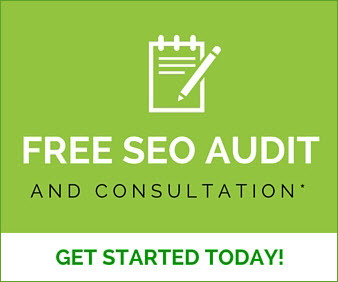 Click the free audit link here or below and we can start immediately with FREE, NO OBLIGATION audit of your website. Lets put a strategy in place to emulate and overcome the results Denver Concrete are enjoying, get you more traffic and more clients.